The document, submitted to the U.S. National Highway Traffic Safety Administration, comes in at a mere seven pages -- dozens less than some of Apple's rivals in the space. Absent are any statistics on the performance of vehicles, or any plans for future tests, much less anything it might launch commercially. Instead the report promotes Apple's safety, privacy and security practices, and offers a simplified view of equipment, testing and driver requirements. 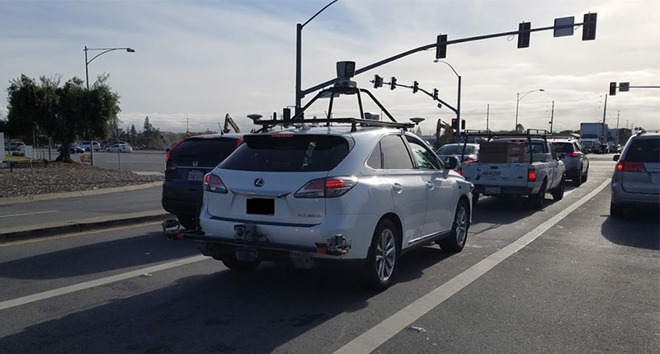 "The sensing component is able to determine where the vehicle is located in the world and can identify and track surrounding objects, such as other vehicles, pedestrians, and bicyclists," Apple says in one section. "This is accomplished using a combination of sensors, including LiDAR, radar, and cameras, and provides high-resolution 360-degree 3D coverage around the vehicle." That wording could describe virtually any self-driving car program. The company does mention "testing at closed-course proving grounds" in addition to its real-world experiments. Rumors have hinted at such work, but the company has kept it a closely-guarded secret. The ultimate goal of Apple's "Project Titan," if one has solidified, is unknown. The company may be designing a full-fledged vehicle, or could still be focusing solely on a platform to shop to third parties. Recently the team lost over 200 workers, though at least some of them have been reassigned. Earlier this month the company disclosed that its test vehicles disengage more often than any of its rivals, though perhaps because of intentionally conservative policies. Any idea as to why they released this report? Being voluntary in nature, this would imply some other objective. Having it generic and short as it came does not give away anything specific, leave alone a USP, so why bother writing it? Good points. I wish I had even a hypothesis to throw at you. I think autos are of strategic importance to Apple... they need to up their game. I like how you're using an article that is literally about how this report shows that we have no idea what Apple is up to, to claim that Apple are "waaay behind" and "need to up their game". It is a mistake to even attempt to have a secret autonomous vehicle program. To be effective you need a large number of vehicles on actual streets in all kinds of traffic and weather conditions. All safety information should be public. Without that, all you have is an interesting experiment, not a real product people should trust with their lives. I’m glad the report is scarce of information that would be used against it in comparison to others by AI and others. Just re-read the second sentence above to understand me. Are privacy, safety and security practices so boring that writing about them in some detail isn’t worth the blogger’s time? Let an Apple car get into an accident of any kind and the lack of safety would be written about. Let an Apple car be electronically hijacked and the lack of security would be written about. Let there be a lapse on removing information of people from collected data and the lack privacy would be written about and referenced forever more. How do you know they don't have a large number of vehicles on actual streets in all kind of traffic and weather conditions? You haven’t been following Apple’s efforts on self-driving cars closely enough. The safety record of Apple’s vehicles on the road is terrible vs the competition. So, yes Apple is way behind. I think it’s safe to say Apple’s efforts haven’t impressed (to date). Most of my post is a prediction... because the “article” doesn’t have anything worth discussing. "Earlier this month the company disclosed that its test vehicles disengage more often than any of its rivals, though perhaps because of intentionally conservative policies." Wrong. Should be, "An analysis of data reported to state of California by companies testing autonomous vehicles shows that Apple reports many more disengagements than any other participants, but this may represent more conservative reporting policies or more conservative testing practices than other companies." We do not know whether Apple actually has more "disengagements" than other companies. We also don't know what this says about the state of Apple's program. "Recently the team lost over 200 workers, though at least some of them have been reassigned." I hope they find the missing workers. It's possible that Apple has inadvertently initiated Skynet. That would explain the disappearances. How do you know I am not a deep-state Russian bot posting? Any idea as to why they released this report? Being voluntary in nature, this would imply some other objective. ...why bother writing it? The answer is Samsung. Apple wants Samsung to invest billions in a product that Apple isn't going to build. This is one way Apple has "doubled up on security." Haha nope, I don't, which is why I don't claim I do. Autonomous Vehicles are an area where Apple should break from its tradition and favor transparency over secrecy. The public has natural hesitance about the safety of these new vehicles, and this hesitance is one of the largest obstacles to the new category succeeding. Transparency by all future providers of autonomous vehicles is vital to help build public confidence in trusting your health and safety to a car with no driver. If you had been following THE REPORTS on Apple's efforts on self-driving cars more closely, you would have also read that this is probably because Apple's approach is to disengage autopilot earlier than other developers' systems. As usual, what people who are not following closely — like you — are missing is that Apple seems "slower" or "late" because they apply tougher criteria to whatever they're doing. They all have to be registered with the State. There's no locations that allow autonomous testing on public roadways without specific per-vehicle approval and under well-defined restrictions AFAIK. The problem with your theory is the public will begin to make assumptions about said product(s) and, not only would this affect stock prices, but completely put a stop to testing of all products in the real world. Yeah strange Apple is sharing info on a secretive project. Same with their upcoming video service. Not so strange when DOT regulations require testing be done in the public eye. Apple can't autonomously drive public highways in secret. Same rules for everyone.